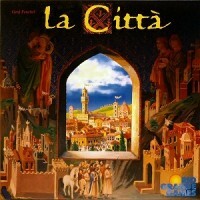 La Citta was published by Rio Grande Games (U.S.A) in 2000. It is Gerd Fenchel’s second published game. In La Citta each player is an Italian prince who controls two castles in Northern Italy. The object of the game is to create cities from these castles and attract population to your cities. La Citta is for 2 to 5 players, ages 12 and up. The components are generally very nice. The board is mounted on thick cardboard and colorful. All the building and terrain tiles are colorful too. The cards have very decent artwork and are language independent. The game’s artwork is reminiscent of renaissance Europe. The ceramic citizen tokens are a nice touch too. Two minor quibbles with the components are the color of the player tokens and the rulebook. The tokens are not primary colors and somewhat difficult to discern. It is obvious the rulebook has been translated and could be better organized and written. Set-up for La Citta is easy but takes a moment. It consists of sorting the building counters, shuffling the two card decks, handing out starting gold and food, and placing the terrain tiles on the board. There is a beginner and an advanced mode for setting up terrain. In beginner mode, the terrain tiles are placed according to the arrangement shown in the rulebook. Terrain tiles are shuffled and randomly placed in the advanced mode. It should be noted that La Citta scales very well as areas of the board are not used with fewer players. For the first year, a starting player is chosen and given the starting player token. In subsequent years the starting player token moves one player to the left. Four Voice of the People Cards are drawn and placed along one side of the board. Three of the cards are placed face down and one card is revealed. In clockwise order, players collect one gold for each of their quarries built adjacent to a mountain terrain tile. In clockwise order, each player adds one citizen figure to each of their castles. The population of a city is limited until certain buildings, such as a market and a public bath, are built in them. There are five Political Rounds in which, in clockwise order, the players take turns playing a card to execute the action shown on it. On his turn a player can play either an Action Card or a Politics Card. Each player has three Action Cards which can be used to take two gold OR start a new city by constructing a castle, OR construct a small building. Small buildings are farms, quarries, schools, statues, market place and fountain. Medium buildings are palaces, public baths and hospitals. Large buildings are cathedrals and universities. Newly constructed buildings must be placed in one of your cities adjacent to an existing building. Then a citizen is taken from the castle and placed on the new building. Castles start with four citizens. Certain buildings provide services such as Education, Culture and Health which your cities will use to attract additional citizens. Instead of playing an Action Card, a player may take one (there are seven cards face up) of the face up Politics Cards and play it immediately. Politics Cards allow players to construct medium and large buildings, gain citizens, temporarily increase food production and peek at the Voice of the People cards. The three face down Voice of the People cards are revealed. The service (Health, Culture, Education) with the most cards is the service in demand. In clockwise order, players check each of their cities for relocating citizens. If their city is within 2 hexes of another player’s city, then the cities are compared using the service in demand. The city which provides more of this service will attract a citizen from the other city. Any buildings without citizens at the end of the phase are demolished. In clockwise order, players compare their food production to the total number of citizens in all their cities. If a player has more citizens than he can feed, then the excess citizens are removed and the player loses an action for the coming game year. The game ends after six years have been completed. Players then determine their Victory Points. Each citizen is worth 1 VP and each city that can provide all three services is worth 3 VPs. Players who could not feed their citizens in the last game year lose 5 VPs. The winner is the player with the most VPs. La Citta is an easy game to learn and a lot of fun, and still holds its own despite being an older game. It is not a typical Euro as there is conflict between the players during the game. Even though it is direct conflict, it is not in-your-face brutal and actually very enjoyable. There is a good amount of depth to La Citta. Knowing which buildings to construct and where to place them is critical. Knowing when to muscle in on a neighboring city is also an important decision. Game time is just less than 2 hours but it goes by quick. La Citta is a big hit with my gaming group and I strongly recommend it to any avid and power gamers. La citta has many little components that you use to populate the city you are building on a hex grid. There are two interactions: the commonly shared board + the voice of the people. While the game scales well with the amount of people, we often got stuck building a city in 2-player games, due to the fact that for expanding we needed more food/water than we could produce. If that happens to your two starting points it’s over. It has a good premise, but just doesn’t work in practice. Add a Review for "La Città"